Steiner Sports' glass display cases are a necessity for any committed sports memorabilia enthusiast. Your timeless pieces, whether autographed hockey pucks or jerseys, will be safe from dust and fading with our top-of-the-line, exquisitely crafted cases. 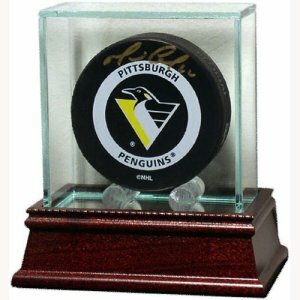 This stylish, UV-protected glass puck case assures your hand-signed collector's piece will stand the test of time. Plus, its high-quality, cherry wood base will complement any area of your home and office.